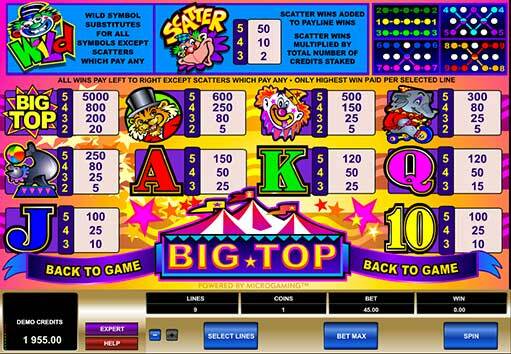 Here's one of the superb new online slots game from MultiSlot that you can play. Roll up, roll up, for the greatest slot on earth! Take your seat, prepare for some big entertainment and see if the Big Top is hiding some big prizes for you in this best online slots from MultiSlot. MultiSlot are a team of developers who specialize in creating online video slots and produce some of the best in the business. Based on the Isle of Man they also build content for social gaming on platforms including Facebook and also mobile platforms. 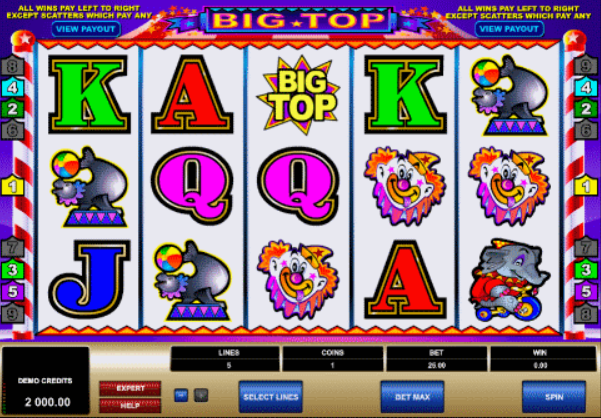 If you love promo's, get the best latest online slot bonuses. Before the days of the internet, mobiles and multi-channel TV all kids wanted to do was get a seat in the Big Top and see the wild and wonderful acts of the circus. Well, now you can combine your nostalgic love of the travelling show and your appetite for slots in this entertaining all action game. 5 reels and 25 paylines all set in the weird and wonderful yellow and red striped tent, offering high octane entertainment and high paying prizes. It’s up to you to decide how much you want to wage on your trip to the circus. The maximum you can pay per line is one credit and you select this on a fun interactive ‘advert’ for the circus. From here you’ll see some ticket stubs where you select how many coins you want to play with and a lines stub to select the number of paylines. On this trip to the circus you’ll see unicycling clowns, trapeze artists, and er, elephants driving around in tiny little cars. If you’re familiar with slots you’ll be familiar with looking out for 3 or more matching symbols and if you land 3 or more of the circus stars you’ll be in for a prize. Prizes that can bring you sums of between 300 and 2000 coins for matching some of the big hitters. Big Top circus wild – If you land the Big Top circus wild you could get your hands on a 20,000 credit jackpot! This wild can be used to substitute for any other standard symbol in the game and create some wild and winning combinations. This is 5 golden reels of top class entertainment. Enormous fun, great to look at and a really engaging play. Everyone loves a day out in the big top, so settle down for the greatest show on earth and make sure you look out for that clown – the ringmaster of bonus cash wins!